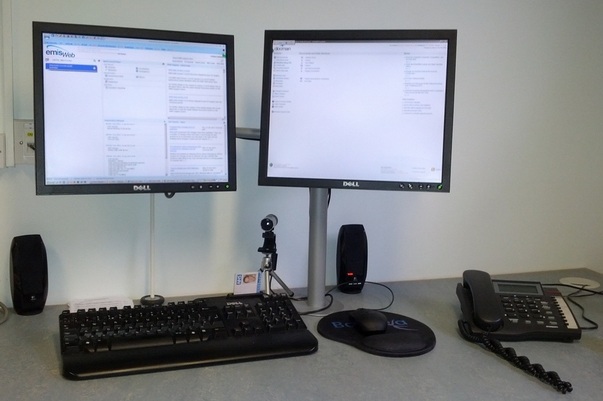 Using dual screen monitors in your consulting room is a simple process. If you have a spare monitor in a storage room you can easily connect this to your computer to give you dual screens. With one screen running EMIS Web, your second screen is free to display Docman or your Microsoft Outlook inbox. The cost to install a second monitor is less than £10 if you already have a spare monitor with a DVI/Displayport (digital) input socket. You simply need to purchase a cable to connect to your PC's second monitor socket. Two monitors, one connected via a standard VGA socket and the other connected via a digital (DVI/Displayport) socket. If your PC is made by Dell and is less than 3 or 4 years old it will most likely have a built-in "displayport" socket. If your 2nd monitor also has a displayport socket then you just need to purchase a standard displayport -> displayport cable. It seems that most Dell monitors don't have this socket - they have DVI sockets instead. In this case you will need a Displayport -> DVI adaptor and a DVI -> DVI cable (you should already have this cable if you have Dell monitors as they are supplied with them). If your PC has a DVI socket and your second monitor has a DVI socket then this is much easier - you just need a DVI -> DVI cable (you should already have this cable if you have Dell monitors as they are supplied with them).